Liver resection under laparotomy in patients with past history of upper abdominal open surgery would need extensive dissection of fibrotic adhesion due to previous operation. Laparoscopic or thoracoscopic operation needs smaller working space and therefore less extensive dissection of fibrotic adhesion. Aim: This paper mentions about the usefulness of laparoscopic or thoracoscopic approach for liver resection in patients with past history of upper laparotomy. Subjects: We have done laparoscopic or thoracoscopic liver resection in 105 cases. Of these cases, 15 cases had history of upper laparotomy. Nine cases were done laparotomy for partial hepatectomy, 5 cases for gastrectomy, and one for cholecystectomy. 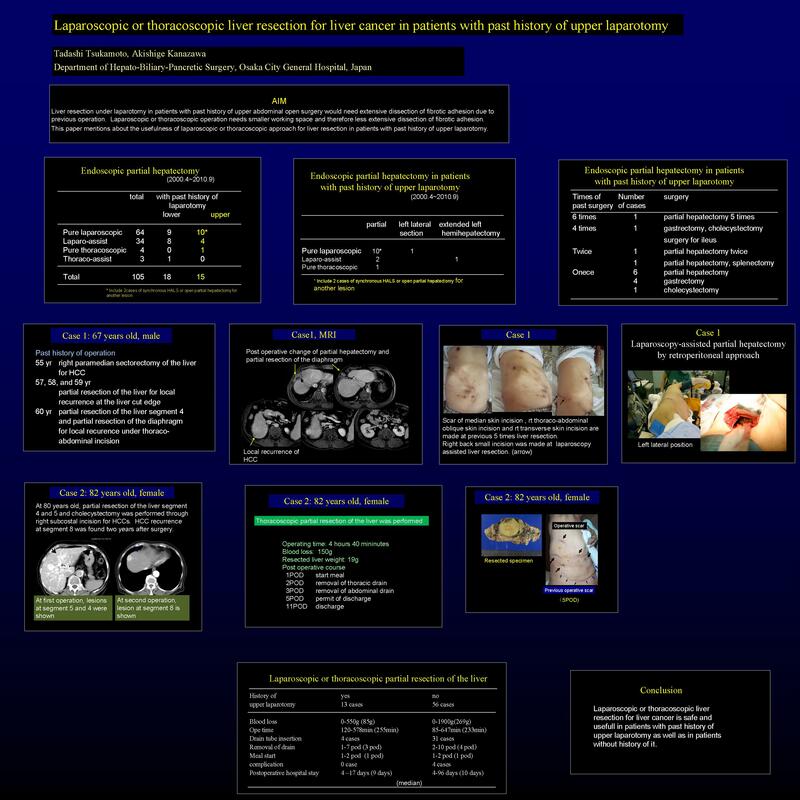 11 cases had previous upper laparotomy once, 2 cases had twice, one case had four times, and one had six times. The last case had previous operations of partial hepatectomy 5 times. Partial hepatectomy was done in 12 cases, extended left hemihepatectomy was done in 2 cases, and left lateral sectionectomy was done in one case. Pure laparoscopic liver resection was done in 10 cases, pure thoracoscopic operation was done in one case, and laparoscopy-assisted liver resection was done in 4 cases. Thirteen cases had one lesion to be resected and two cases had two lesions to be resected in each lobe of the liver. In one case, pure laparoscopic partial hepatectomy was done for one lesion in the left lateral section, and then hand-assisted partial hepatectomy was done for another lesion in right lateral section. In another case, pure laparoscopic partial hepatectomy was done for one lesion in the left lateral section, and then right medial sectionectomy was done under right thoracolaparotomy. Result: Blood loss during laparoscopic or thoracoscopic partial hepatectomy was 0 – 550 ml (mean, 165 ml). Postoperative clinical course was uneventful in all cases. Postoperative hospital stay was 4 – 12 days (mean, 8 days). These outcomes in these cases were not deferent from them in cases without past history of previous upper laparotomy. Conclusions: Laparoscopic or thoracoscopic liver resection in patients with past history of upper laparotomy was safe and useful as well as in the patients without the history. This endoscopic approach decreases the extention of dissection of the adhesion in comparison with open approach. This results in good clinical course and short hospital stay. Therefore this approach should be selected in these patients.